Devotion ... Courage ... Sacrifice. And a dose of caffeine and vitamins and sugar. Thailand has a whole load of energy drinks, from the ever popular Red Bull to Lipovitan. What are they for? Well, for mixing with vodka and getting totally wasted, of course! Well, up to you. These drinks are concentrated doses of wake up juice. A quick energy boost, helpful for staying awake on a long night out, for a hangover cure, a kick in the head in the middle of the day when you are falling asleep at the keyboard. 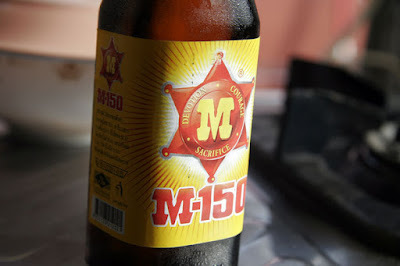 I don't reckon they taste great, but my favourite is M-150.